70 years ago today marked the greatest single defeat of the United States of America. 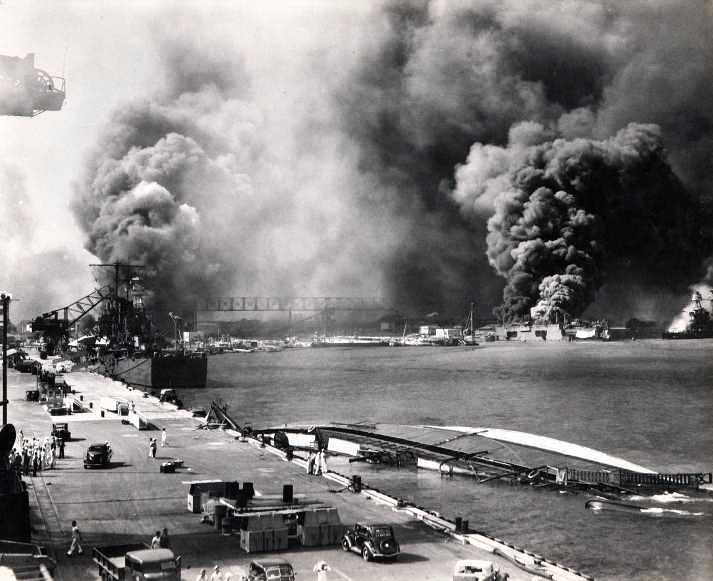 The Imperial Japanese Navy launched a surprise attack against the United States Naval Base at Pearl Harbor, Honolulu, Hawaii, destroying or damaging 8 old battleships that formed the core of the United States Pacific Fleet, other navy ships, and 188 military airplanes. Japan declared war on the United States and the United Kingdom the same day. American deaths were placed at about 2,402, with 1202 seriously wounded. The United Kingdom would also suffer defeat on December 10 with the sinking of two battleships outside of Singapore including the famous ship the Prince of Wales, which had a major role to play in the sinking of the German battleship The Bismarck. 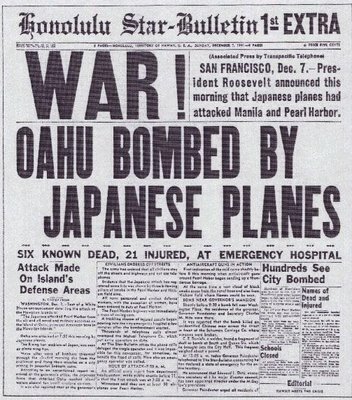 This day is known as "Pearl Harbor Day". Any American born before 1930 has vivid memories of this day, much like a later generation has of the World Trade Center attacks in 2001. Radio, not television, conveyed news of the attack back in 1941. Japan and the United States were negotiating a peaceful settlement to the Pacific conflict earlier in the week. The United States was embargoing fuel and materials due to Japan's invasion of China in the 1930's. The attack surprised the Japanese negotiators in the United States. The attack had limited military value, 6 of the 8 old battleships were ultimately repaired, and none of the aircraft carriers of the United States were damaged. The United States would hand Japan its greatest military defeat in the Second World War 6 months later at the Battle of Midway by sinking 4 of the 6 Japanese aircraft carriers used in the Pearl Harbor attack at a cost of one of one of its own, the Yorktown. Japan never really stood a chance of defeating the United States, The industrial potential of the United States was massive, and allowed for quick rearmament. Japan also thought that the people of the United States would not be tolerant of war and would ask for a quick peace on Japanese terms. In reality, the anger of people of the United States was so great that anything short of a complete surrender of Japan was unacceptable. The United States would go on to defeat Japan in 1945, and would ultimately destroy Hiroshima and Nagasaki with atomic bombs. President Franklin Roosevelt declared December 7 "a date which will live in infamy" in an address to Congress. President Roosevelt was a great orator; if you have not heard his speech I play it here below. He promised victory to the United States and gained the confidence of the American people with this speech. President Roosevelt could not walk during his 11 years as President and was confined to a wheel chair due to the Polio virus. Although the media of course knew that he was an invalid, they never showed him in a wheel chair or mentioned it in press reports. It is doubtful the media today would show a President such great respect. 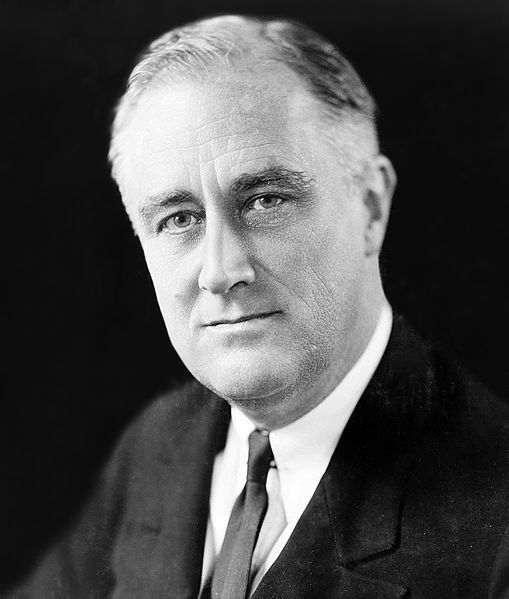 President Franklin Roosevelt- Elected for 4 terms as President. Some conspiracy theorists feel that President Roosevelt knew about the attack and did not respond in order to get the United States into the Second World War to help the United Kingdom and Russia defeat Germany. I do not believe it and feel this is insane conspiracy talk. It is a controversial point among some however. "Yesterday, December 7th, 1941 — a date which will live in infamy — the United States of America was suddenly and deliberately attacked by naval and air forces of the Empire of Japan"